The Downtown Open Market in Boca Raton takes place once a month ending in May of 2014. This pet friendly, rain or shine event helps promote local business owners, indie artists, chefs, musicians, antique dealers and jewelers. There will be 40 or more vendors at this open market including handmade indie crafts, vintage jewelry, specialty pet items, art, baked goods, clothing and accessories and much more. This wonderful event is held at the Monument Piazza at Royal Palm Place. Parking is free for the public. Boca Raton Downtown Open Market is a great way to become more acquainted with many of the exciting new businesses, artists, and musicians in the area in addition to helping these lovely boutiques and galleries grow within our community. Live music will be one of the many fun aspects to this open market as well as sampling specialty food, natural bath and body treats, and unbeatable flea market finds! 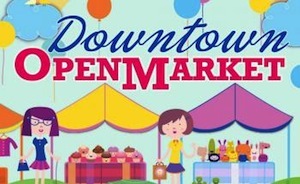 The remaining dates for this open market are Jan 19, Feb 16, March 23, April 27, and May 18. Be sure not to miss one of these future dates and truly get to experience wonderful people who create the heartbeat of Boca Raton.